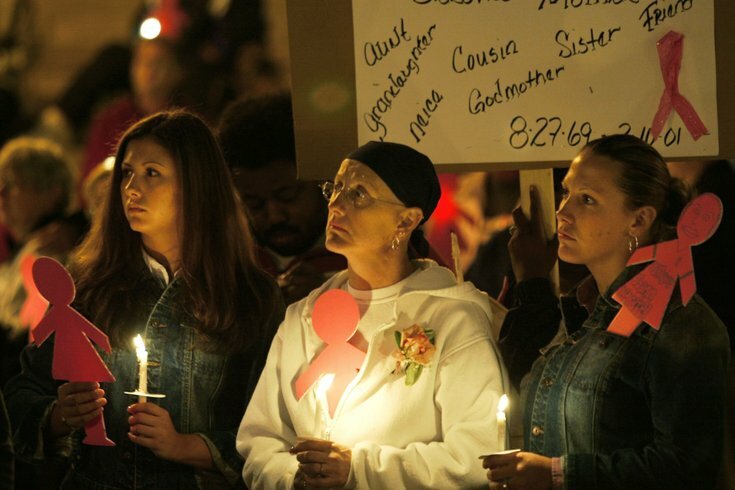 Joann Maratea, center, along with her daughters Lois, left, and Rita, all from south Philadelphia, participate in a candlelight vigil on the first day of Breast Cancer Awareness Month, on the steps of the Philadelphia Museum of Art. In younger women with breast cancer, having a family history of the disease may not worsen their survival odds, a new study suggests. These results should reassure younger women diagnosed with breast cancer, study co-author Dr. Ramsey Cutress, a researcher at the University of Southampton in the U.K., said by email. “They should not be concerned that their family history alone will affect the chance of a successful outcome,” Cutress said. Worldwide, breast cancer is the most common malignancy in women. About one in nine women will eventually develop it, according to the U.S. National Institutes of Health. The risk increases with age, from one in 227 at age 30 to one in 26 by age 70. A woman is more likely to develop breast cancer if her mother, sister or daughter has been diagnosed with the disease, particularly if the diagnosis was before age 50. Cutress and colleagues studied 2,850 women diagnosed with breast cancer by age 40 at 127 hospitals in the UK from 2000 to 2008. Half of the women were followed for at least six years. Two-thirds of the women reported no family history of breast cancer. Half of the women were at least 36 years old at the start of the study. The main goal of the study was to see if family history impacted how long patients survived after treatment without their cancer worsening. After five years, about 77 percent of women with a family history and about 75 percent of patients without any history were symptom-free, as were 72 percent and about 69 percent, respectively, at eight years, the researchers reported in the British Journal of Surgery. The difference was small enough that it might be only due to chance. When researchers looked at data based on the type of breast cancer tumors, they found family history made no difference in symptom-free survival whether or not women had tumors that grow in response to the hormone estrogen. The researchers also found no difference in survival odds for women with no family history, compared with women who had a mother, sister or daughter diagnosed with breast cancer. One limitation of the study is a factor known as survival bias. Because the researchers recruited women up to a year after diagnosis, the study excluded people with the most aggressive tumors who died quickly, the authors acknowledge. It’s also possible that the impact of family history might take more time to show up, particularly for women with slower-growing tumors. Still, the findings validate what many doctors already believe about family history – that it isn’t the most important factor in determining survival after a breast cancer diagnosis, said Dr. Julie Nangia, director of the breast cancer prevention and high-risk program at the Lester and Sue Smith Breast Center at Baylor College of Medicine in Houston. “If you have a family history, you are more likely to develop breast cancer, and young women are also more likely to develop a more aggressive type of breast cancer,” said Nangia, who wasn’t involved in the study. Younger women with a family history may want to consider genetic screening to learn whether they are at increased risk for certain faster-growing types of breast cancer, said Nangia. They should also start getting mammograms when they are 10 years younger than the age their mother or sister was diagnosed, and also do self-exams.